Hord Coplan Macht's downtown Denver office inside Dairy Block, 1800 Wazee Street. It is growing ever easier for employees to spend less time in the workplace as the ease of remote computing and working from home increases. 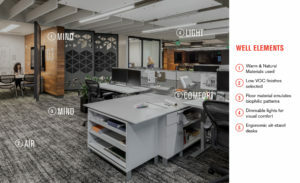 This is a challenge for collaborative firms like ours, and one that Hord Coplan Macht has taken on with the creation of our new Denver office in the Dairy Block. We believe that maximizing the amount of face-to-face collaboration among team members is critical to providing the best service. As we began the design process for our new office, we considered: What features could the workplace provide to continue encouraging a healthy, interactive and team-oriented space? with kitchenette, comfortable group furniture, a variety of meeting spaces, warm wood materials, plants, and seamless technology, we aimed to redefine the workplace and invigorate an unmistakably creative environment that promotes collaboration, wellness and productivity. 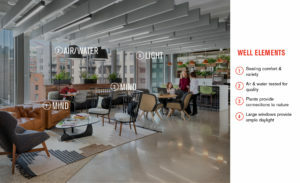 In our workspace design, we pushed to provide connections with the outdoors both directly as well as psychologically. The WELL certification guidelines encourage the use of biophilic elements (affiliation with nature for human health and benefit). Those elements include natural materials and colors, carefully tuned lighting, and patterns which can be perceived as natural, such as those that mimic a tree canopy or mountain range. Another aspect of biophilic design is providing spaces of prospect (public overlook) and refuge (private reflection). Our workplace provides both types of work spaces: the “podium” is a raised platform meeting area that can also be used for presentations while the “coves” are private team rooms with rotating wall panels that control the level of privacy. An in-house survey revealed that our principals were out of the workplace as much as 40 percent of the time while their private offices remained unoccupied. In light of this, we eliminated most private offices in favor of more meeting spaces that could blur the line between private office and accessible team rooms. Replacing offices with flex group rooms like the “coves,” phone rooms, and meeting booths allowed for much more efficient use of the office floor area, spontaneous work sessions and team gatherings of varied sizes. Every employee was also provided with a motorized sit-stand workstation, personal task lighting, and a choice of desk chairs. So, not only can staff adjust their personal workstations, they are also free to select from a variety of meeting spaces to suit their team’s needs. The incorporation of artwork in the space is vital to both the creative mission of the firm as well as the general well-being of the occupants. Artwork in the space ranges from a Denver skyline mural, to generous display walls for designs, to an entire table in the central hub covered in sketch paper and art supplies. 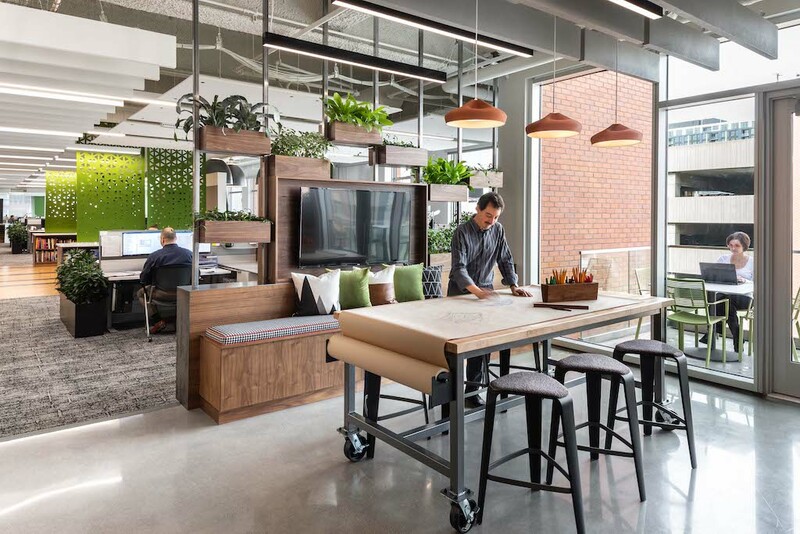 We began the design process for our new office with a holistic approach focused on the health and wellness of our associates and creating an engaging, productive and collaborative environment. Using our own environment to inform and shape future designs for our clients’ spaces has been an enlightening opportunity and one that we believe will help us contribute to forward-thinking design in the built environment. Lyn Eller is a principal in the K-12 studio at Hord Coplan Macht, an architecture, landscape, interior design firm. He has worked on a multitude of projects that include higher education, performing arts, and residential spaces over the course of his career. Lyn currently leads the Hord Coplan Macht Denver Design Task Force where he develops, evolves and leads the design process.